The exhibition will be on view from August 4 â€_October 4, 2016. An Opening Reception with the artist with live reading of the book will be held on Saturday, August 13, 2016 from 4 â€_6 pm. 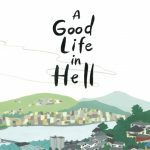 A Good Life in Hell is currently available for purchase online at www.agoodlifeinhell.com, Lulu.com, and Amazon.com. A Japanese translation published in July 2016 as「生きてã_‚‹かぎり語り続ける」by Shufunotomo Co. (www.shufunotomo.co.jp) is currently available only in Japan.